College Basketball’s big men’s tournament gets underway today, and while “March Madness” routinely provides some of the most exciting moments in sports in any given year, is also big business. How big? The personal finance website WalletHub has put together an infographic explaining some of the economics behind it. The average single-game ticket costs about $258. 20 percent more beer is sold during the tournament. 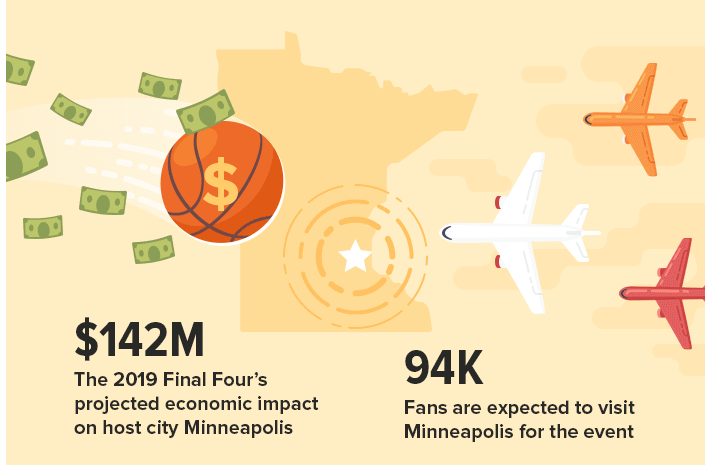 Final Four host Minneapolis expects a $142 million economic impact. 24 million people will participate in bracket pools. And nearly nine in 10 workers say office pools build better camaraderie in the workplace. New Jersey Business Today kinda wishes WalletHub would bury that bit about lost productivity, though.